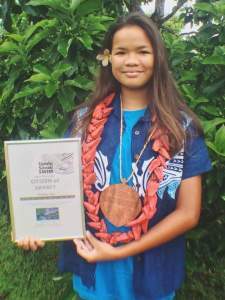 On Friday, April 6, 2018, Noelani Day, Age 14, from Holonga Tongatapu made history by becoming the youngest person to ever attempt and complete the 22.3km Apolima Strait solo swim. The Apolima Strait is the longest ocean swim in the Southern Hemisphere and is notorious for the strong currents that run between Upolu and Savaii Islands in Samoa. Noelani, a Tongan local who has grown up training with Malolo Swim Club since she first learned to swim at age 8, completed the swim in 8 hours, 11 minutes, and 12 seconds. Samoa Events Director, Seti Afoa, confirmed that the race conditions were the worse they have had in the history of the event. The waves and oceans swells caused many support kayaks to flip over and three swimmers pulled out mid-race due to the severe conditions. Noelani also encountered a few jelly fish stings, but the the most difficult part of the swim was the currents. About five hours into the swim, Noelani Day hit the notorious Apolima Current and had to battle it out by swimming almost in the same spot for two hours, before breaking through. The swim was both physically and mentally challenging and Noelani had to battle out the most difficult part of the swim when all her reserves had been spent. This is where her she had to dig deep and gather strength from the heart and swim with sheer determination and will power. In spite of being the youngest competitor, Noelani finished 2nd female and 3rd place over all. The overall Winner of the 2018 Apolima Strait was Bronwyn Copeland of N.Z., who also made history for becoming the first female to win the entire race. Noelani was fortunate to be sponsored by Digicel Tonga, which made her participation in this event possible. She dedicated her swim to Tongan girls and youth in sports, due to all the challenges of being an athlete in a country with some recent restrictions placed on female athletes, no proper pool to train in, and zero facilities and resources. When speaking to reporters from Samoa Planet, she said "I just want them to know that anything is possible with God by your side, and that if there is something you love doing, do it. You can do anything if you put your mind to it." She hopes that by completing the Apolima Strait Swim she can encourage other young Tongan girls and youth to always pursue their dreams no matter what obstacles are before them.